In 1972, Joan and her family move to California. 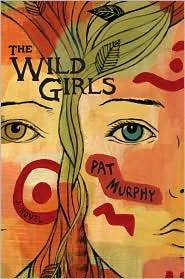 Joan quickly befriends an eccentric and independent girl who calls herself "Fox," and the two girls dub themselves the "Wild Girls" -- brave and fearless conquerors of nature. But Fox and "Newt" (Joan) are anything but fearless, and struggle with families that are disintegrating around them and afraid of what this means for them. They do, however, share a love of writing and through a Summer course at Berkeley in creative writing, they learn a lot more about themselves as well as how to craft a story. Obviously autobiographical, I would have normally been prone to dismiss this story as lazy writing (how hard can it be to tell your own life story, peddling it as fiction?) but this one is done terribly well. There are many brilliant observations about human nature, beautifully-written narrative, and just the right amount of angst to make the story and the characters matter. In sum, this is a gorgeous book and a model of what autobiographical YA really should be about (i.e., take stories from your youth and spin them into something substantive that transcends your individual experience). Highly recommended.